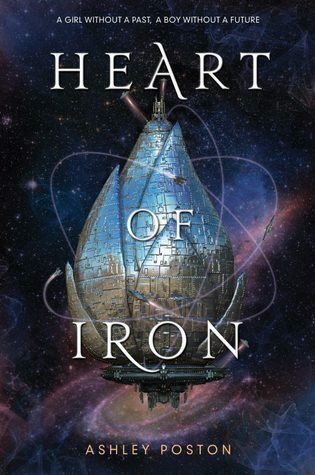 Heart of Iron by Ashley Poston is the first book in the new young adult science fiction fantasy series by the same name. This series is said to be a retelling of Anastasia set in space but truth be told I’m not familiar with Anastasia so I can’t compare the two. It’s also compared to Six of Crows but that seems way off when you simply compare the pacing of the two as this one is extremely fast paced. The story is told by changing the point of view between several characters in the series including Ana, Robb, Jax, and D09 with Ana being the main character and the story focusing around her. Seventeen year old Ana had been found by a space captain and crew with D09 protecting her as she had been injured and lost all of her memories and was drifting through space. D09 is one of the last remaining metals, or AI, and he and Ana share a bond from their experience together. Now however D09 is glitching and Ana vows to do whatever it will take to save him even if that means going against the crew but as she tries to steal the coordinates to an abandoned ship that may have the answers someone beats her to it. Heart of Iron is an extremely fast paced read that drops readers right into full blown space action right on the opening pages. As much as I love a fast paced read I’d dare say this one might of needed a tad bit of a slow down with having so many points of views to learn and an elaborate world to build. It seemed to jump from one point to another without taking a breathe and as weird as it sounds coming from me I think it would have benefited from a bit more depth to things between. Otherwise it’s an interesting start to this space opera that I would say is worth checking out with me giving this first book 3.5 stars. Ashley Poston loves dread pirates, moving castles, and starry night skies. When not lost in a book, she’s lost in real life, searching for her next great adventure. She is also the author of Geekerella and can be found online at AshPoston.com.